Up to 250,000 Square Feet of Range! Parking team, the coffee bar, media team...there are all sorts of things going on during any given church service that require communication in order to go smoothly. Two way radio walkie talkies not only help improve communication by giving quick access to people in all different areas of the building, two way radios can also utilize earpieces to block out the noise from the band to clearly hear and accomplish what needs to be done. Do you need to leave the room for something but don't want to leave the children alone in Sunday School? No worries! Two way radios allow you to ask for help in situations where you normally wouldn't be able to accomplish two things at once. Two way radios are also a major factor in safety during church trips, Vacation Bible School, and youth group. It can be difficult to keep an eye on all of the kids, but two way radios allow for quick communication and faster reaction time should an emergency happen. Churches come in all shapes and sizes so there is no one radio that is right for every church. We'll help break it down for you here! If you're a smaller church and only need to communicate up to about 200,000 square feet, then the CLS1110 and CLS1410 are great options for you. These are simple radios with a large push-to-talk button on the front and a display screen to show battery life and which channel you are on. The only difference between these radios is that the CLS1110 has 1 channel while the CLS1410 has 4 channels. The Motorola CLP1010 is even smaller and lighter than the CLS1110 and CLS1410, but it must be used with the earpiece that is included with it. It will not work without an earpiece. It will also get a little bit less range than the CLS radios. But, if you're a small church and are looking for discrete communication then this radio will be a great choice! For somewhat larger churches in the 250,000 square feet range, you can move up to the Motorola RMU2040. The RMU2040 is a bigger radio and will cover larger area. This radio is extremely durable and will be great for indoor and outdoor activities. For very large churches up to the 350,000 square feet range, the Motorola RDU4100 is the best two way radio for you. This is a powerful 4-watt radio and will work well indoors and outdoors over large areas. This radio has great audio quality and can withstand rugged environments. All of the Motorola two way radios mentioned above except for the CLP1010 will work with the audio accessories shown above. This includes the HKLN4604 Swivel Earpiece and HKLN4599 Earpiece both with simple push-to-talk communication. 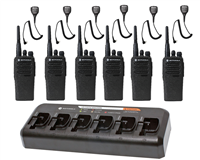 These radios will also work with the HKLN4601 Surveillance Earpiece for security or discrete, professional communication.